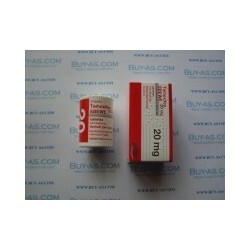 Package: 30 tabs (20 mg/tab). 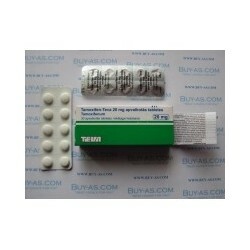 Tamoxifen by Ebewe, Austria is an oral preparation containing 20mg of the substance Tamoxifen Citrate. Tamoxifen also offers another great benefit to bodybuilders due to the fact that it can greatly increase the amount of testosterone that the body makes by stimulating LH production. This makes the drug a great choice for PCT. While the drug has obvious benefits concerning estrogen buildup in the body, it is important to note that it can have adverse effects towards progesterone related steroids. Because of this, it's recommended that bodybuilders don't use Tamoxifen in conjunction with steroids such as Deca Durabolin or Trenbolone. It's also important to note that Tamoxifen doesn't reduce estrogen throughout the body, and that those athletes looking to minimize overall water retention and bloat should look towards true estrogen blockers such as Arimidex. Bodybuilders often use Tamoxifen in doses of 20-40mgs a day throughout cycle duration where gyno is a concern. Those looking to incorporate Tamoxifen into their PCT program will typically run the substance at similar doses for 4-6 upon the discontinued use of all steroids. Users may also choose to add Proviron and/or HCG to their PCT protocol.